Topher Mokrzewski, Music Director, and Miriam Khalil, soprano, rehearsing BOUND, Against the Grain Theatre, 2017. Photo by Darryl Block. “It’ll be a shocking, immediate connection to what is going on in the world today,” says Joel Ivany, Artistic Director of Against the Grain Theatre, on the company’s upcoming workshop production, BOUND. The music of Handel’s operas seems to strike a unique balance between storytelling at extremely high stakes, and laying out a blank-slate-like foundation for varied facets of a single emotional state. The stand-alone arias make for clean excerpts, and lend them well to re-organization and re-appropriation. “Handel is kind of like the human element in all of us,” Ivany adds. Justin Welsh, baritone, and Joel Ivany, Artistic Director, rehearsing BOUND, Against the Grain Theatre, 2017. Photo by Darryl Block. Against the Grain Theatre is no stranger to a mash-up - or “smash-up”, as Mokrzewski calls it. In 2016 they workshopped No One’s Safe, a “Mozart Murder-Mystery Mash-Up”, that used fragments of Mozart arias in a choose-your-own-adventure-style piece of immersive music theatre. BOUND is in part a response to a Handel-focused challenge posed by Alexander Neef, General Director of the Canadian Opera Company, where AtG has begun a two-year residency. Miriam Khalil, soprano, and Kevin Lau, composer, rehearsing *BOUND*, Against the Grain Theatre, 2017. Photo by Darryl Block. Alongside more standard rehearsal-room practices, there is time reserved for talking about tough subjects - “intimate things,” Mokrzewski calls it - and guest speakers who can help connect the fictional to the real world. Ivany’s focus on the refugee crisis called for a Q&A session with an immigration laywer, who told stories of her clients’ struggles with red tape, distrust for the system, and inhumane detainment. If you go to see a performance of BOUND this month, you’ll find yourself in the midst of AtG’s ongoing exploration of the opera-goer’s experience. You may find yourself in a dystopian version of your current world, even pulled aside by officials who encourage you to give up your ID and phone while you wait, separated from your party, for no clear reason. 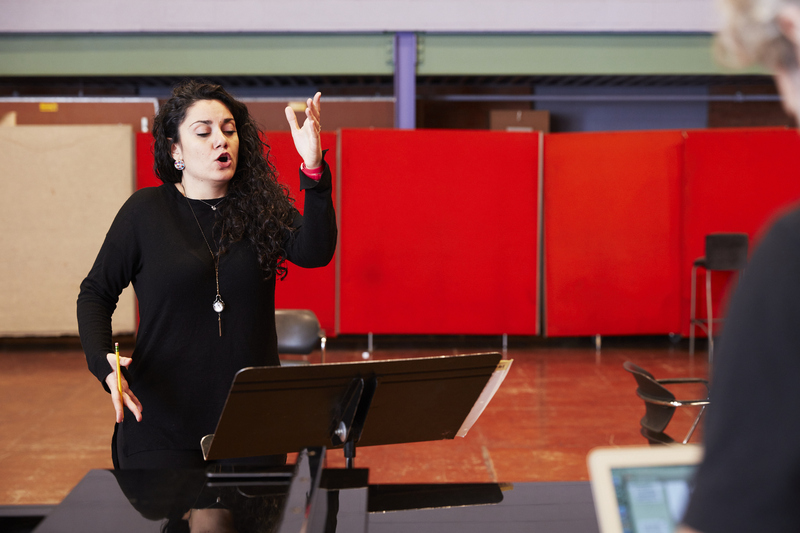 Miriam Khalil, soprano, rehearsing BOUND, Against the Grain Theatre, 2017. Photo by Darryl Block. A certain type of demographic goes to the opera, and perhaps there’s only a small amount of overlap between that demographic and those who may understand more clearly what it feels like to be detained, mistreated, or bound by others’ rules. BOUND is the first step in what Ivany and Mokrzewski hope is a long-term, larger-scale project. It’s a chance to see the genesis of a work that’s designed to shift and transform to suit both its artists and its external influences. 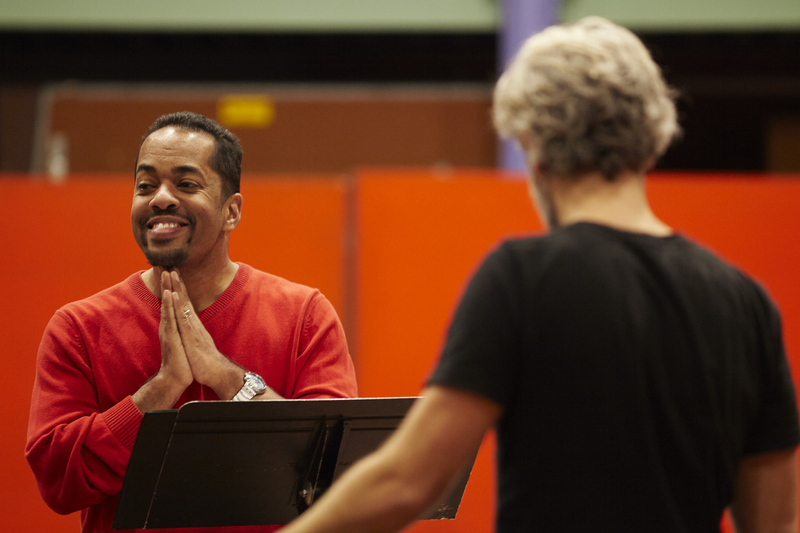 BOUND runs December 14-16 at the Canadian Opera Company’s Hal Jackman Studio. For details and ticket information, follow our box office links below. A response to "our response"